In Zsh (and other shells), aliases may be the most important feature for increased productivity. A simple rule is this: the more often you run a command, the shorter it should be. I’ve written about this before, in Efficient Way to Improve Console Productivity. That was the command that I ran to generate the list above. It expands to “alias | glark -g ‘^.='”. That finds all directories and pipes them to sort. So I have been writing one-character scripts/functions (in Bash) for each of the above, where the script understands context as well as the targets. For example, “s pluralize” run from a directory that contains a “Rakefile” will expand to search (using glark) only for Ruby files. “e program.tar.gz” is the equivalent of “tar ztvf program.tar.gz“, and “e program.zip” lists the zip file, with entries sorted by name. 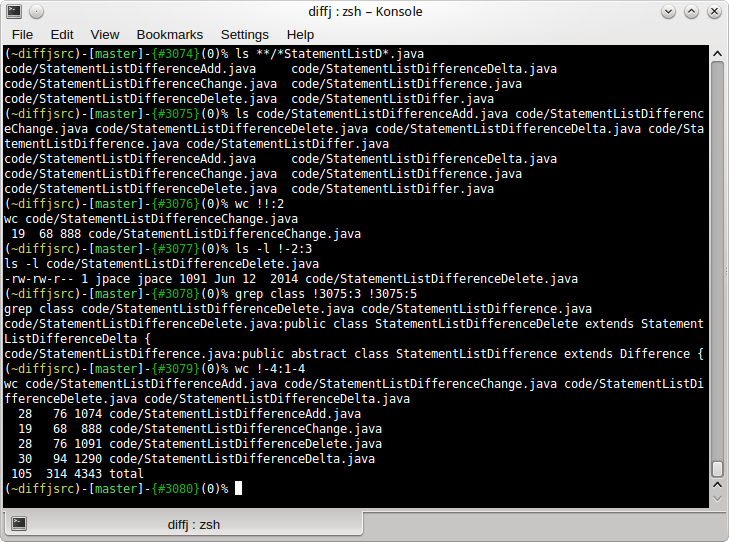 “d dir1 dir2” runs a recursive diff on the directories, and “d path/to/file ../dir2” will diff “path/to/file” against “../dir2/path/to/file”, if the latter file exists. I do this to avoid the tedious repetition of comparing one code base to another (such as two branches, when merging them): “diff path/to/file1 ../dir2/path/to/file1“, “diff path/to/file2 ../dir2/path/to/file2“, etc. Although this project is in its early stage, and the output is still rough (i.e., containing debugging output), it already has been quite useful, so I thought I would share. The project is at Github here.